• The Old Testament is a rich source of theology and doctrine that is presupposed by the New Testament. Without it, Christian theology would be seriously deficient. • Mastery of the Old Testament is crucial to an understanding of the New Testament. • The Old Testament offers, by teaching and example, practical principles of belief and behavior for contemporary times. Who God was and what He did then can be replicated in the lives of men and women today. Separating the verifiable biblical and extra-biblical data from the various interpretations of that same information, the book further shows how the Old Testament forms the platform and matrix from which sprang the life, ministry, and teachings of Jesus and the church. The World and the Word will help students see an entry point into the very heart and design of God who loves them and wishes to make them the special object of His grace. Dr. Eugene Merrill is distinguished professor of Old Testament studies at Dallas Theological Seminary and distinguished professor of Old Testament interpretation at the Southern Baptist Theological Seminary in Louisville, Kentucky. With degrees from Bob Jones University (Old Testament studies), New York University (Jewish studies), and Columbia University (Middle Eastern studies), Merrill is considered among the most outstanding Old Testament scholars in the United States today. Michael A. Grisanti is professor of Old Testament at The Master’s Seminary in Sun Valley, California. 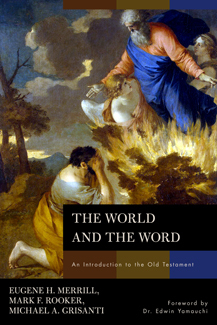 One in a series of twenty Old Testament verse-by-verse commentary books edited by Max Anders. Includes discussion starters, teaching plan, and more. Great for lay teachers and pastors alike.